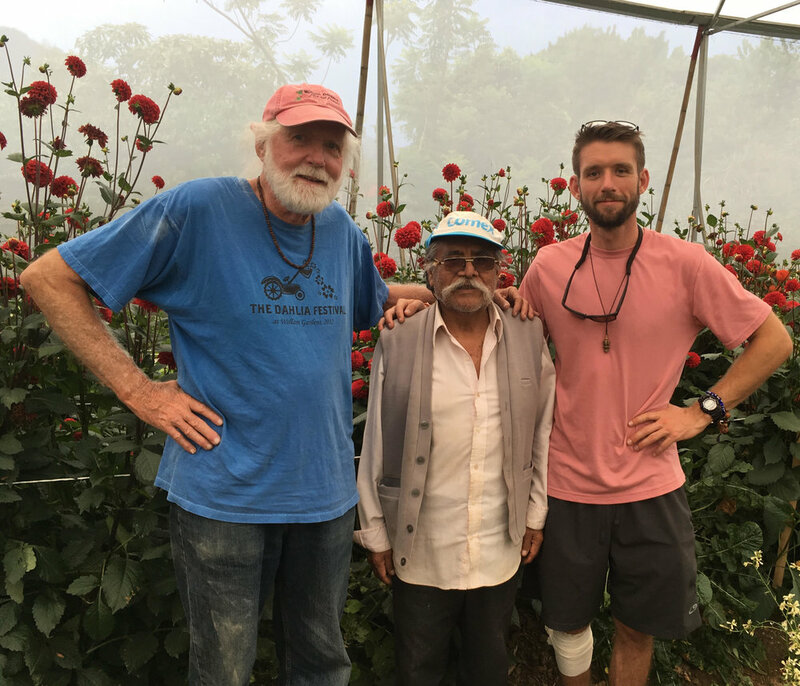 Bob’s dahlia story about his adventures in Tepoztlan, Mexico. My wife’s friend, Kilof, married Priscila Rodriguez Bribiesca, a mexican lawyer studying in USA. They have lived in Washington DC with their 2 young boys until the Spring of 2017 when they bought a house and moved to Tepoztlan. Their motivation was to give their boys more Mexican exposure and Spanish language. In the Fall of 2017, when the older boy’s school was damaged by the earthquake, the family came to DC for a week. During that visit I gave Priscila a dahlia and told her that the dahlia was the “National flower of Mexico”. She had no idea and declared she’d never seen them there. Over the winter I decided I wanted to try growing dahlias in Mexico so I went to Tepoztlan for a week in March where It seemed I was enjoying the company, the food, the weather, but, what about the dahlias? First, I found a greenhouse next door to my friends house and met the owner/grower, Brigito. Second, I made contact with Floreska who had dahlia tubers for sale. Third, I met Javier Magoya at his small cut flower farm near Tepoztlan. So, in mid April 2018 I went for a week starting my adventure by staying in Ixcatepec, a weekend resort area near Ville Gureeerro, the largest flower growing area in Central Mexico. I was in the care of Floreska owners, Ana and Alberto Puebla. This sister/brother pair are the Mexican representatives of Gloeckner Company, a world wide flower wholesaler which supplies most of my 9000 dahlias growing on my Virginia farm. Ana and Alberto took me to the Gererro wholesale flower market where despite hundreds of growers, I could not find one dahlia. They also took me to their farm where they had recently planted a few rows of dahlias and we had a great lunch. From Floreska’s inventory, I picked out 565 dahlia tubers of 10 varieties and then we all toured Javier’s very large growing operation. Javier brought me back to Tepoztlan and the next morning Alberto and Ana brought the tubers to Tepoztlan. Planting began and by days end we had 500 dahlia tubers in their beds in Brigitos greenhouse. The other 65 tubers went to Javier for him to experiment with. So, we had dahlias planted !! Will they grow ?? In Late June, I received news of blooms and a few pictures That’s Kilof with just a sample yellow dahlia and Brigito with a cafe au lait. I knew it was time to return to Tepoztlan so I planned a July trip with my son, Ben, who was visiting my farm before heading off to graduate school. Ben has been teaching Spanish for the past 4 years and his ability to communicate helped us immensely. We rented a car at the airport, drove to a great B&B in downtown Mexico City and eat tacos at midnight on the street. Before driving to Tepoztlan the next afternoon, we visited a huge flower market in Mexico City where we found only one bunch of dahlias selling for $2 for 10 stems ! Flowers we’re all fabulous and all cheap! When we arrived at Brigito’s greenhouse in Tepoztlan, we found a jungle of dahlias. All had grown strong and tall and many were leaning or fallen over. We cut arm loads and packaged them in craft paper sleeves which we brought from our farm. What to do with all the dahlias ? We took some to a local restaurant, we gave many away at a local soccer practice and enjoyed them at home. 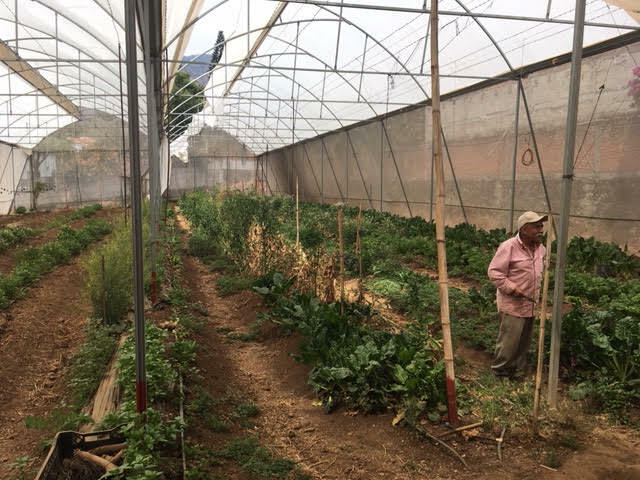 To complete the circuit of test dahlia growing Ben and I then took an all day trip to Villa Guerrero to see Floreska owners Ana and Alberto Puebla. Alberto had 4 long rows of dahlias and was maintaining them well. There were some beautiful and even unusual plants. We had hoped to continue on to Valla de Bravo to meet famous designer Gabriela @ lamusadelasflores, but we were unable to connect so we drove back, returning and getting lost for 3 hours in Mexico City rush hour traffic. We proved that we can grow great dahlias. What we didn’t expect is that all flowers in Central Mexico are well grown and very inexpensive. Dahlias do not have a long vase life so it is hard to get a premium price for a beautiful dahlia. It may be the Mexican National Flower, but we have not used that as a marketing angle. Another take away.. since it does not freeze, how long will these plants continue to produce? Is there a market for the tubers ? When would one dig them ? Should we eave them for a couple years ? We cut back most of the huge cafe au lait plants at Brigot’s and expect them to be productive again in a month or so. Javier joined us our last day and told us he was yet to see his tests because he had been traveling. There are many unanswered questions. When will I go again ? I have helped Brigito by sending him some financial assistance so he’ll keep the dahlias alive. I am hoping to return in January/February of 2019. The adventure continues!